Aqualoy A22 inboard propeller and industrial pump shafts undergo more quality controls than any competing brand. These prop shafts are used in a wide variety of applications such as work boats, pleasure craft, naval vessels, and pumps. The Aqualoy® process produces a rounder, straighter, stronger shaft. All of our A22 shafts from 3/4" - 4" diameter are precision machined in our Mazak Nexus 350M CNC turning lathe to insure all machining is within .0005". 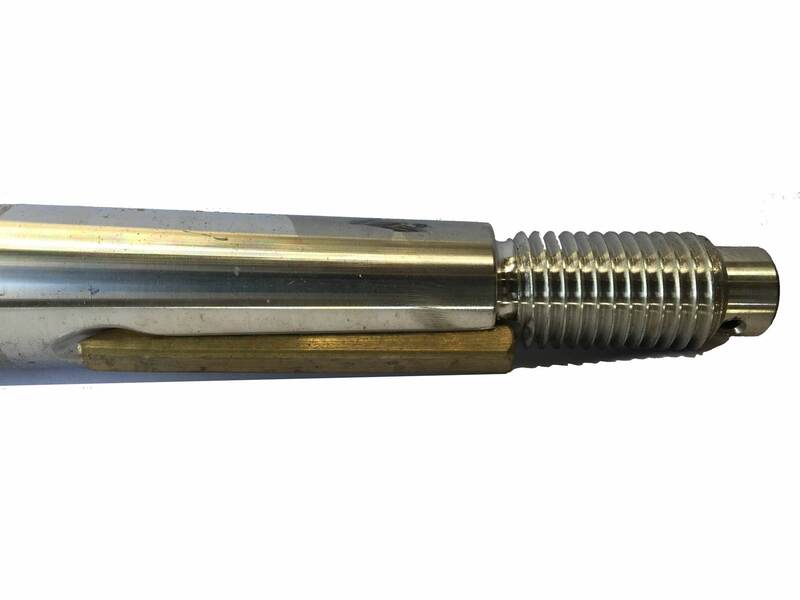 All single tapered shafts will have a propeller taper machine according to SAE J755 specifications, unless other instructions are given. In addition to the propeller taper machining, a single square keyway will be machined for the coupling end of the shaft. The dimples for the set screws can only be machined with the coupling in place. If you purchase a coupling from us, there will be a $92.00 to fit and face the coupling to the shaft and during this process, the dimples for the set screws will be completed. All double tapered shafts will have a propeller taper machine according to SAE J755 specifications, unless other instructions are given. In order for us to machine the coupling taper, we will require either a drawing of the coupling taper or the following dimensions must be specified(as there is not an SAE standard for coupling tapers and these tapers do vary); length of taper, small end diameter of taper, and length and size of threads. Deep Blue Yacht Supply boasts a full service machine shop, with capabilities allowing for machining of stainless shafts up to 9” in diameter. As a testament to the master skill level of our machinists, many discerning yacht, boat, and facility owners across the globe have their A22 stainless shafts machined at Deep Blue Yacht Supply. Current lead time for the production of new custom stainless shafts is 3-4 business days. The stainless shaft shop at Deep Blue obviously has masters working the stainless boat prop shafts. I unpackaged the shaft and it was an absolute beauty. My Aquamet 22 shaft was packaged greatly, and was a piece of art when I took it out of the craft. Almost didn't want to put it on my vessel, it was that beautiful. I've been in the boating industry for 30 some odd years, and this was the finest stainless shafting I've ever seen. Thank you for great service and quick delivery.